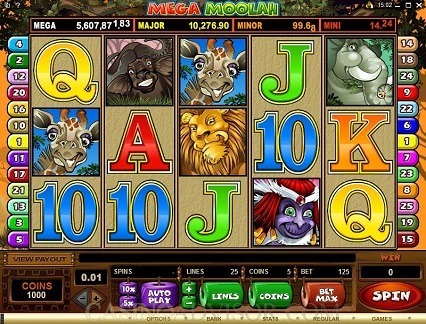 Game Information: Mega Moolah is without question the single most played and most talked about progressive jackpot game ever produced. The game has arguably made more millionaires more often, than any other progressive jackpot game that has ever been created by any software provider. The game is most certainly a jewel in the crown of Microgaming. It currently holds the Guinness Book of World Records for highest ever pay out to a single player. A British payer won close to NZ$20 million while playing on his mobile device in 2015. The game is probably one of the highest volatility progressive jackpot pokies ever produced and regularly pays well over a million. 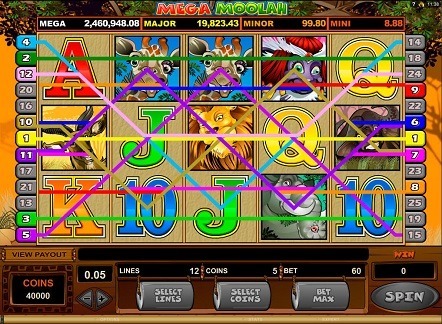 The wild symbol in Mega Moolah is represented by the lion and can be used to substitute other game symbols with the exception of the games scatter symbol to make easy and quick winning combinations. The games scatter symbol, the monkey, is used to trigger the games bonus round when three or more of them land anywhere across all 5 reels. The free spins bonus round comes with a cool 3x multiplier which can boost winning totals significantly. Besides the massive payday potential that this game offers on a fairly regular basis, the other big draw card for fans of this game is its graphics and sounds. The game offers awesome and fun African safari graphics that are quite reminiscent of the classic and romantic African adventure movies from the past. The game is filled with sounds from the African plains and savannas, with the growl of lions, the cheeky monkey sounds and other wild animals, who roar and whoop with approval at every winning spin. The gameplay is also super-smooth and fast enough to not get boring, yet slow enough so it doesn’t seem overwhelming. The games color scheme also makes it very easy to follow and see what’s happening on every spin. 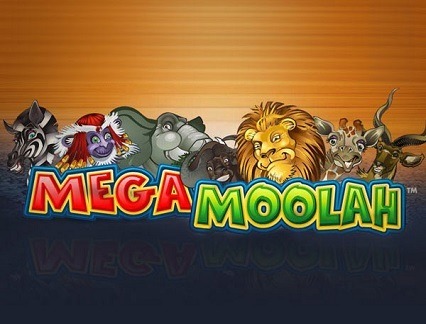 This is the part that draws most players in -Mega Moolah’s progressive jackpot. Sure the game offers an exciting and entertaining gaming platform, but it’s the chance at a potentially life-changing payday that really keeps them flocking in! Mega Moolah has made close to 20 instant millionaires over the past decade and possibly the best thing of all is that you don’t need any special skills, strategies or tricks to stand a chance of becoming the next millionaire. This is because entry into the big jackpot is totally random and, if you are lucky enough to get picked, you get to face the famous Jackpot Wheel. The Jackpot Wheel represents four different progressive jackpots which are all linked into Microgaming’s global progressive jackpot network. The jackpots are all different in size and the total at any one moment is all dependent on how many players have contributed to its total. Lion Wild Symbol which can be used to substitute for other game symbols, creating bigger wins along with a 3x multiplier which can create some very big totals, very quickly! Monkey Scatter Symbol, three or more will trigger the free spins bonus round. Free-spin Bonus Round Offers free spins with triple payouts which can also build very quickly, often to as much as 50x the wager.